Make Your Loved Ones Happy With Unique Customized Picture Jigsaw Puzzles! If you have been looking for a perfect gift for your loved ones, then look no further as you have reached the right place because nothing says love like a customized jigsaw puzzle.The process of making one is just within the reach of your fingertips! Yes, it’s that easy. Just upload a memorable picture, sit back and relax as our team will get on to creating a marvelous customized jigsaw puzzle. 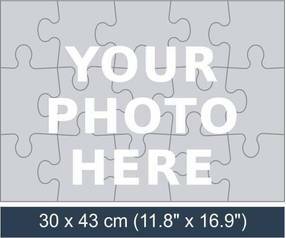 To make your own photo puzzle select jigsaw size and upload a photo, design or artwork. You Can Substitute The Personalized Photo For Any Picture You Adore! The advances in technology have made those things possible that were deemed as impossible by old people. The same kind of technology has enabled us to provide people, from the entire world, with the perfect gifts in the form of customized jigsaw puzzles! Now you no longer have to play with random pictured jigsaw puzzles when you can have jigsaw puzzle with your picture on it! Different Sizes Are Available to Suit Everyone’s Preferences! 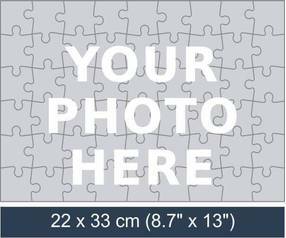 Now you have the freedom to choose a specific size from PuzzlesPrint total collection of 12 standard customized picture jigsaw puzzles. The availability of various sizes is to ensure that you earn total control of you customized jigsaw puzzles, meaning that not only you get to choose a customized photo, but also the size of your choice! 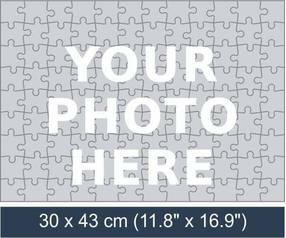 Our customized jigsaw puzzles can be delivered to any provided address. You don’t need a reason to go for our customized picture jigsaw puzzles if you are passionate about your picture jigsaw puzzles. But it will be much more fun to play and solve a jigsaw puzzle that has your face on it. Also, you can substitute the photo for any picture you like such as pictures from your wedding or your vacation trip to Malibu so that every time you play with your customized puzzles you will be reminded of the countless memories associated with the picture. The reasons to choose our customized picture jigsaw puzzles are countless. Your friend’s birthday is coming up? Gift them our customized picture jigsaw puzzle. Your parent’s anniversary is around the corner? 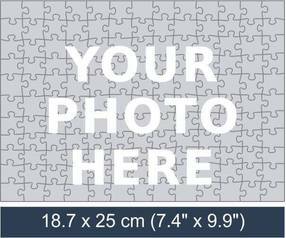 Present them with our customized jigsaw puzzle. Another reason to choose use is that we don’t compromise on the quality of the pictures and will always make our customers happy by printing the picture with high definition. Also, we will wrap the customized jigsaw puzzle in a customized box that will feature your photo! You can make a photographer fall in love with you by gifting him/her with a picture jigsaw puzzle that has their celebrated artwork as the picture. We can list countless other reasons that will influence your decision into opting for our customized jigsaw puzzles, but it will take many other posts to cover. The reasons mentioned above are just a few of them most popular reasons as to why people choose customized jigsaw puzzles over any other customized photo gift.